Toys As Tools Educational Toy Reviews: Shop ARK and Be Victorious! Shop ARK and Be Victorious! Cool idea, actually, brilliant, genius idea, you say.... but the price is too high? If you thought that then you are not alone. So I tried to think of some questions that help me decide whether or not to cough up $32.44. Do you fight at the table? Do you think "Neanderthal" when you see your kid eat? Does your child have trouble writing? Writing and self-feeding are connected skills. 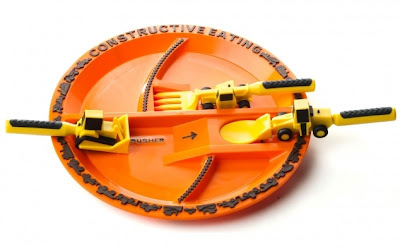 Does your child use his other hand to assist his fork in bringing food into his mouth? Think shoving spaghetti in mouth vs. slurping it in. Would you want to buy this for your favorite niece or nephew or your best friend's kid who could really use some encouragement at the table? Does your child insist that his foods remain in isolated compartments? Ok, here's more encouragement.... How about a confession? I saw this product online one day and thought, "OOOH, must try if not, then I'll buy." I was never able to hold of the company folks to access a review unit and despite my savvy shopper ways, I have never spotted this plate and utensils on sale, not even on Amazon! Last but not least, eating is a LIFE SKILL as in a college degree is good but being able to feed yourself is kind of more important, no? This investment of $32.44 is something that you want to be reaping the rewards for way after childhood. Hey, it's still cheaper than a Super Mario Brother Wii game. Hope I will get to share a review about this one day. It's such a great idea. (Update 9.20.13- got this- expect a review soon). 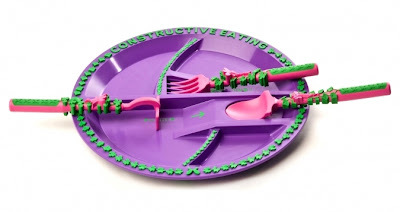 And I bought my Constructive Eating products from ARK, my affiliate. ARK Therapeutic is a truly amazing store! They do offer free shipping within the contiguous U.S. states for purchases of $100+. I like that so many of their products are being sold for the lowest price available. The best thing is that when you shop online at large retailers, you may NOT be getting the latest models just because the SKU number still remains the same. (Yes, I know, that totally stinks, but it's true!!!) But ARK picks the finest products just for you and they manufacture a lot of what they offer in their store. Much of it was made in the U.S.A.! Feeling lost when you get there? No worries! I got your back! LOVE Kinetic Sand. If you only want this then you can find out how much you have to pay by adding it to your cart and then going to your cart and pressing the "estimate shipping" button. It's easy. They don't make you input all your info before you decide on how much shipping is going to affect your shopping decision. I think that is very thoughtful! I loved Moon Sand but Mr. Toys Are Tools hated the mess and he finally threw it away when I wasn't home. That's okay because I have Kinetic Sand now. I hear it is flying off shelves too. And fellow jungle primates: I've never seen it lower at Amazon (or with free ship either) and what is cool is that in the box, you just get sand. No molds, no color, no figurines... just sand. It's like the package says, "Yeah, you are a no B.S. customer. I dig that about you." BTW, I do have this one. Fat Brain Toys sent a box to me as a present a while back. It's heavy! So you want free shipping on this one so go for another $85 to spend. :) It's not going to be hard here. I recently went to NY NOW and met Mark Lim. You may have seen him and his wife Hanna pitching their company on Shark Tank. She and Mark brought Lollacup to the world because they found that their daughter could not get an adequate amount of liquid because of the spill-proof valves. I am so psyched to test this out with a specialist. The weighted straw bottom and overall straw design are supposed to be conducive to good sipping. I am curious to test that out! But one thing that I don't have to find out is this: straw sipping is good for kids (as long as they don't bite on it). I think it helps with calming/focusing and oral motor strength-building. The packaging and price point also make it a cool gift idea. Stay tuned, I will be reporting my finds after I receive testing samples! 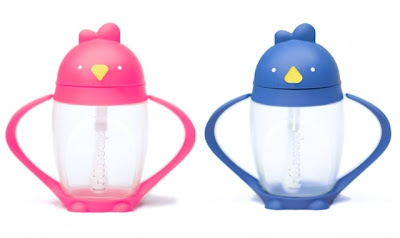 And last but not least, I respect my fellow Korean Americans for deciding to make Lollacup the Made-in-the-USA child health and feeding item that it is. What a smart product they have! Oh please please please Santa bring this to me. They are so beautiful, I want to eat them. Apparently they were created by an occupational therapist to promote the tripod grasp in young children. Okay, that is nice and all but why give these to children when you can have a lovely bowl of these on your desk to stare at and feel great about the day. I could choose the right colors to fit my mood for the day. A rainbow mix for happy days. Shades of yellow and green when Spring comes? A bowl of different shades of blue for those rainy gloomy days? Don't let anyone know that they are soy based wax and made in the U.S.A. Tell folks that they are probably dangerous so that no one will touch or steal your beautiful crayon rocks. (Update 9.20.13- got this- expect a review soon). Whether you have one or more children, I can't help but think that it's good to have two of these pencils. But there are so many ways to buy it, how does one pick? If you are interested, I can help! If you want to have two pencil sets and have some extra pencil tips lying around then I would definitely go for Option B. If you are a teacher or therapist.... please please please buy an extra one to lend out to families (but make sure they GIVE it BACK!) As parents, our biggest problem is not being able to try-before-we-buy. You can help us by lending it to us. Heck, I'd even borrow it for a fee! 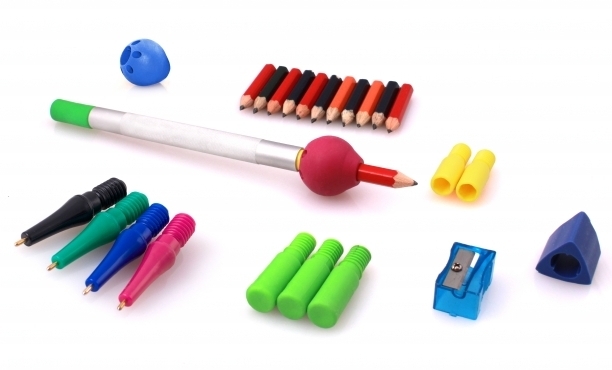 Additional note: Here is a link to a reader question about the pencils. While some may think this is a luxury, for some, having bite-sized foods is a strategic way of reaching out to kids who need a bit of scaffolding at meal time. Maybe they stuff their mouth? Maybe they dislike taking bites and instead like to pick and tear their foods which can end up messy and be a turn-off socially. Besides, when something comes in uniform bite sizes, it is just more appetizing? Think like this, when was the last time you ate a California roll that was not cut into the little tiny cylinders? Taking a bite off an uncut roll? Well I did that a couple of times in my life when I was really hungry, I'd never do that in front of people. I don't have this but I am so curious about it. Why? Well, I would like to know if it can hold a Big Mac. Maybe it can't and maybe the makers of this tool are horrified that I mentioned Big Mac and their tool in the same sentence (sorry). But it is because while I am no McD's fan, I love Big Macs. My eldest does too and can even forego the Happy Meal just so he can eat the Big Mac. But my kid is distracted and he eats slow and what happens when you eat a Big Mac slow? It kind of breaks apart and much of it ends up in the cardboard container and you end up being mad at him for not eating something that you don't love him eating anyway. For that mess of a sandwich and any other messy sandwiches, it looks like this Tot Tools thing can help. But I'm not sure. I should try it, no? You might want to wait for me to do so but if you are looking for a little something to make the $100 mark to qualify for free shipping, this could be just the thing. I love this thing! If I ever wrote a story about the best educational miracle tools of the world, this would be in the top ten, sitting up there with an iPad, unifix cubes, wooden blocks, computers, and dice. 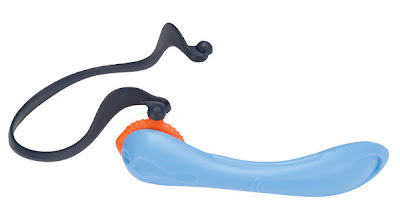 Read my review about Whisperphones and then go get a couple of these things for school and home and a back up for lending to friends or possible loss or theft. And parents, get the big one for big kids (GR. 4+) and yourself too. For me, I love using MY Whisperphone to proofread my work or practice a speech. Why buy Whisperphone? My kid takes a while to digest information verbally. He has trouble connecting sounds to letters sometimes (phonemic awareness). To me, the Whisperphone is doing what the ARK Tran-Quill pencil does. You get more learning done even though you are not doing more work! It's as if it helps you become more absorbent like the difference between a cheap paper towel and Bounty. I love Bounty and I love the Whisperphone! I haven't tried this personally but my Spidey Sense tells me this is a real winner. The key words are "no stain" and "no residue." This kit apparently comes with play ideas of varying difficulty and molds too. This seems like a very cool birthday gift too. More importantly, Bubber doesn't dry out and is gluten-free. I mention this because I used to make gluten-free playdough and so if this is used in school then I really want to make sure that no one gets left out. It's also nice for the teachers to not have to worry about this and spend extra time asking parents to send in a substitute. I have no idea how these folks can manage to remember everyone's allergies. My hats off to teachers as they face another year of memorizing all their students' scary allergies. * Jon Elder Robison wrote in his book, Be Different: Adventures of a Free-Range Aspergian about a time when he was having a first dinner date with a woman. He talked about how horrified she looked as she watched him eat. Now that I think of it, I should say this to my son. I think it will motivate him. He doesn't like girls yet but he knows he will. HA! I really want to know what you think about when you are back to school shopping. Is it all about rulers, notebooks, and markers or do you think about troubleshooters, problem-solvers, need-satisfiers like fidgets, beanbags, assistive tech, chew stuff, etc... No answer is wrong here. Just want to know what is on your mind! It's important to me! Disclosure: Toys are Tools is a very very very proud affiliate of Ark Therapeutic. That means that if you, make a purchase after going through one of my links in this post, then I, will not only be so happy, but I will be receiving a commission at no additional cost to you! This post was written with the idea that you might want to consider a different kind of back-to-school shopping. I really hope you do. Starting the new year off with an attitude of PROaction vs. REaction is my back-to-school wish for my family and yours. Thanks for sticking with me! Back to School means cleaning the classroom, making sure the area is open, accessible, logical, safe and engaging. And then getting ready to jump right in and tackle what needs will be met and how through the rest of the year. Oh wow, I didn't know that the book was reprinted to a book format. I use to use it when it was sold in a white binder. I liked it but that was a long time ago. And thank you for pointing out the crayon. It says that most Crayola crayons would fit and so I am going to try it now. Will keep you posted. Thanks! I haven't heard of those pencils before - I don't know why I don't try the 99 cent store for everything, they seem to have it! I teach Pre-K/Kindergarten Prep at a Private School and have been lucky enough to have parents offer to donate old books and games their children outgrow. It always seems that even if I don't need it for my classroom, I know another teacher who does. When i worked Public I would share with parents about how the classroom was using Donorschoose to gain resources for specific needs of the class and any donation to that would go towards helping the class. I think GC are a great idea - because even with a stipend to buy supplies for the classroom, teachers are always going out of pocket. Toy Tips: MORE LEGOs for LESS! Review: Bathroom Independence is Possible!